The accumulation of free radicals and its negative impact on cellular homeostasis, collectively known as oxidative stress, continues to be implicated in the pathogenesis of aging and clinically relevant diseases such as cancer, neurodegeneration, cardiovascular disease, and inflammation. Enzo Life Sciences has expanded its offering of products for oxidative stress research with the addition of the Cyto-ID® Hypoxia/Oxidative Stress Detection Kit and Mito-ID® O2 and pH Sensor Probes. These assays provide unique and time-saving solutions to enable accurate profiling of hypoxia, reactive oxygen species (ROS) and mitochondrial dysfunction related to oxidative stress. 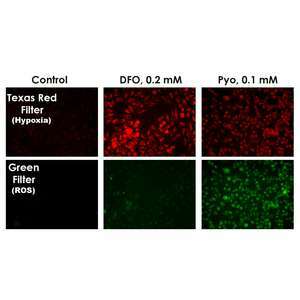 The Cyto-ID® Hypoxia/Oxidative Stress Detection Kit is a unique multiplex assay kit that uses two membrane-permeable, fluorogenic probes to simultaneously detect hypoxia and ROS in live cells. The Hypoxia probe fluoresces red following its conversion by increased nitroreductase activity (characteristic of hypoxic cells), while the Oxidative Stress Detection Reagent fluoresces green in the presence of a wide range of ROS, including hydrogen peroxide, superoxide, hydroxyl radicals, and peroxynitrite. The kit is suitable for analysis of suspension or adherent cells by fluorescent microscopy or flow cytometry, using industry-standard filter/laser combinations. Also new is a panel of high-throughput Mito-ID® O2 and pH sensor assays for assessment of mitochondrial function. Mito-ID® Extracellular O2 Sensor Kits utilize an oxygen-sensitive phosphorescent probe that increases in signal intensity with O2 consumption. Amenable to 96- and 384-well microplates and standard fluorescent plate readers, these assays provide real-time assessment of mitochondrial oxygen consumption within minutes following treatment, and are fully validated using mitochondrial inhibitors and uncoupling agents. High sensitivity and cell permeable versions of the probe are optimized for cell based assays and intracellular O2 consumption monitoring, respectively. As a companion assay, the Mito-ID® Extracellular O2 Sensor Kits can be multiplexed with the Mito-ID® Extracellular pH Sensor Probe, a pH-sensitive phosphorescent probe that monitors cellular acid extrusion resulting from mitotoxicity-associated increases in glycolytic flux. These new kits and probes for hypoxia and mitochondrial function are the latest additions to a comprehensive Enzo catalog of tools for oxidative stress research, including CELLestial® probes for monitoring free radical production, organelle function, and cell death, high-sensitivity ELISA and detection kits, widely-cited Stressgen® antibodies, and an industry-leading collection of pro- and anti-oxidant compounds, high-purity spin traps, and Screen-Well® compound libraries. For more information or to order Oxidative Stress or other Enzo Life Sciences products, please visit us at www.enzolifesciences.com or call us at 1-800-942-0430.